Just had a good sob. We had Biggest’s “Milk Completion” party today. Before I fell pregnant with Littlest I had weaned Biggest onto breastfeeding only for naps and bedtime. Then during my early pregnancy with Littlest, I weaned her off feeding back to sleep if she woke in the night, having cuddles instead. A couple of months later, Daddy started comforting her if she woke in the night too (she wouldn’t accept him before). Then Daddy did a couple of bedtimes, particularly on days when the nursing aversion which developed for me in pregnancy was really bad. We got through the nursing aversion together, some good days and some bad (the one where I shouted for her to get off me when she wouldn’t delatch one excruciating bedtime feed sticks out in my mind). I was determined to stick it out until at least baby was a few months old. I was determined for her not to associate her losing breastfeeding with the baby taking it away. A few more months later, Danny changed hours at work so he could be at home more, so less days, but longer hours on the days he was in, which meant I’d be doing bedtime alone a few days when he returned to work after Littlest. And then very late on, she finally dropped her last nap. So we were just down to one bedtime feed per day (or none, if Daddy did them). And then Littlest was born and the nursing aversion with Biggest went away a little and I was quietly hopeful for a long term tandem feeding journey. And we’ve managed so far. But on the days where Danny isn’t home for bedtime, it’s really, really hard to manage with both. And the nursing aversion returned with a vengeance. And I started dreading bedtimes again. And I knew Biggest was picking up on it as slowly they began to get longer, which made the whole thing worse for both of us. The thought of her going to bed sensing I couldn’t wait to get the hell out of there was breaking my heart. I decided to hang on until Littlest was 3 months old and then end mine and Biggest’s breastfeeding journey, so that we could both enjoy that special time together again. I racked my brains trying to think of a positive way to frame it to her. I really liked the idea of these stopping breastfeeding “parties” I’d read about other families doing, but they all seemed to centre on saying goodbye. I really wanted it to be more of a celebration of the journey and how far she’d come. So it came to me a couple of weeks ago to make it a “Milk Completion” party. She has a thing about completing things. She loves to complete jigsaws and houses she’s building for her toys out of blocks. The first time I mentioned it I saw sadness lurch in her. But as we started to talk about it more she seemed to settle into the idea. I’d ask what kind of things she wanted at the party. “Crisps and cake and liver sausages (Paw Patrol) and orange juice and party hats”. So I’d planned it for today. And then today came and I faltered on whether to actually go ahead with it. And then I thought about all the tough bedtimes we’ve had recently and how desperately I want to get back to nice ones and decided to push on. I reminded her this morning that it was her party day and she’d now completed her milks. The same glimmer of sadness as when I first told her about it. And then she was just really happy about the party. She ate her crisps and cake. She invited all her toys to join in. 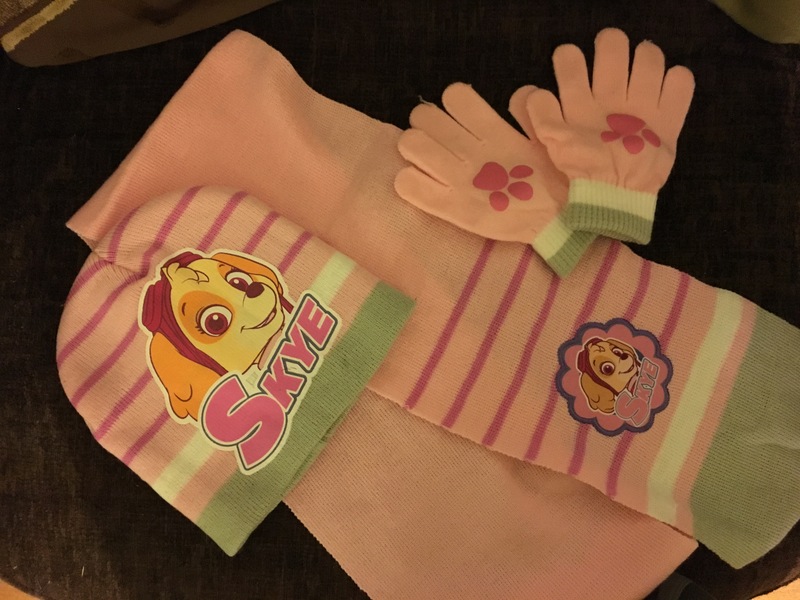 And she had her party gift, a Skye hat, scarf and glove set, which she put on immediately. Somehow today she seems even more mature than she already did. Daddy took her up for bedtime and I curled up with Littlest, a slice of party cake and baby pictures of Biggest and cried and cried. The emotional journey of breastfeeding is something no one ever tells you about at the beginning. Not that they probably could. It’s one of those things you have to experience yourself, like anything else we go through as mothers. And looking through those pictures of my Biggest girl, feeling how time has flown and how grown up she seems at her ripe old age of 2 years and 8 months, thinking of how much we’ve been through together, I was instantly reminded of the temporary nature of all things in this journey of motherhood. In this life. My best friend and I were lucky enough to experience this amazing adventure together for 2 years, 8 months and 17 days. And now we begin a new one. Next Post OK, Anxiety. I’m listening. This made me tear up! What a wonderful way to celebrate your journey together. Oh, thank you so much! It’s been a very emotional day. So glad you like it m.
It really does! It’s amazing how long it feels at the time, not just breastfeeding, but all things, and in hindsight it was merely a flash. I said to my husband that things feel super fast with our second baby. Thank you for reading! Oh wow. I have a little something in my eye. While I can’t relate to breastfeeding as I never did it, I can say that so many lasts are replaced by firsts! That’s the best way to look at it. I hope it’s continued to go well for you. 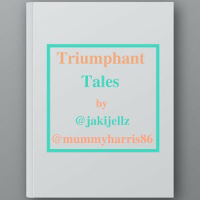 Thanks for linking up to #TriumphantTales. Hope to see you again next week. Yes, totally! Many new adventures to be had. As one door closes, and all that…thank you for having me and for reading! We always appreciate so much more in hindsight, don’t we? ❤ Thank you for reading. This is so lovely! such a beautiful way for you to mark the end of your journey together. You will both find a new adventure soon and it will bring a similar emotion you felt with the bond of breastfeeding. Thank you for linking up to #TriumphantTales, I hope to see you back again tomorrow!